Keep that last part in mind while reading Trump’s positively astounding tweet from yesterday morning. Trump's denial that anything came of the Trump Tower overture is the lone firewall between this tweet becoming an admission of a crime. However, if you believe president “the meeting was about adoption of Russian children—wait, no—it was to get information on an opponent,” is being truthful, then you really should pay more attention to what's going on in the world. Our president's brain is melting, and that's before you get to the fact that he's been a serial liar his entire life. 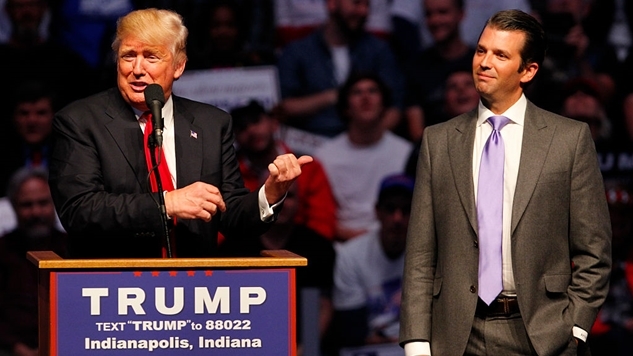 There's been a lot of misinformation coming from team Trump over the famed Trump Tower meeting on June 9th, 2016, so here is a helpful thread laying out the timeline from trial lawyer, Max Kennerly. April 18: George Papadopoulos connects with Ivan Timofeev, director at a Russian gov't-funded Russian International Affairs Council. May 2016: The Republicans who had paid for all the work going into Fusion GPS / Christopher Steele stop paying, because Trump clinched the GOP nomination. June 7: Trump's NJ GOP primary victory speech includes, “I am going to give a major speech on probably Monday of next week [June 13] and we're going to be discussing all of the things that have taken place with the Clintons." June 15: Guccifer 2.0 starts posting DNC emails. I'll leave you with one more piece of potentially circumstantial evidence. Rob Goldstone—the British publicist who helped set up the Trump Tower meeting—checked in for the secret meeting on Facebook at 3:57 pm (I've written that sentence countless times over the past year and it still hasn't become any less hilarious). At 4:40 pm that same day, Trump tweeted this. As I highlighted in an article last year, every Trump tweet about Hillary Clinton’s e-mails prior to this one used the number 30,000—including one less than a month before the Trump Tower meeting. Each subsequent one after this tweet used the number 33,000—which was a previously reported figure by CNN. So what changed that day? Why did Trump start using a more specific number 40 minutes after a meeting “to get information on an opponent” began? I would say that Robert Mueller will reveal the answer to that question, but given that the most damning information in this saga has come from POTUShitforbrains and his failson namesake, we can probably expect one of the Donald’s to tweet the truth in the coming weeks as Mueller’s probe continues to close in on a president who openly solicited the aid of a foreign adversary.